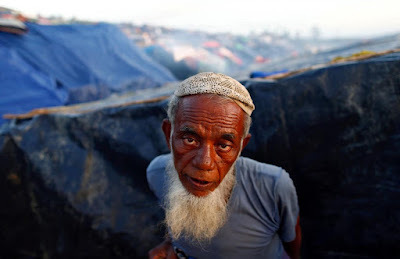 SITTWE, Myanmar - Thousands of Rohingya Muslims in violence-racked northwest Myanmar are pleading with the authorities for safe passage from two remote villages that are cut off by hostile Buddhists and running short of food. "We're terrified," Maung Maung, a Rohingya official at Ah Nauk Pyin village, told Reuters by telephone. "We'll starve soon and they're threatening to burn down our houses." Another Rohingya contacted by Reuters, who asked not to be named, said ethnic Rakhine Buddhists came to the same village and shouted, "Leave, or we will kill you all." Fragile relations between Ah Nauk Pyin and its Rakhine neighbors were shattered on Aug. 25, when deadly attacks by Rohingya militants in Rakhine State prompted a ferocious response from Myanmar's security forces. Tin Maung Swe, secretary of the Rakhine State government, told Reuters he was working closely with the Rathedaung authorities, and had received no information about the Rohingya villagers' plea for safe passage. "There is nothing to be concerned about," he said when asked about local tensions. "Southern Rathedaung is completely safe." National police spokesman Myo Thu Soe said he also had no information about the Rohingya villages, but said he would look into the matter. Rathedaung's five surviving Rohingya villages and their 8,000 or so inhabitants are encircled by Rakhine Buddhists and acutely vulnerable, say human rights monitors. Maung Maung, the Rohingya official, said the villagers are resigned to leaving, but the authorities have not responded to their requests for security. At night, he said, villagers had heard distant gunfire. "It's better they go somewhere else," said Thein Aung, a Rathedaung official, who dismissed Rohingya claims that Rakhines were threatening them. In late July, Rakhine residents of a large, mixed village in northern Rathedaung corralled hundreds of Rohingya inside their neighborhood, blocking access to food and water. On Sept. 13, he said, he got a call from a Rakhine villager he knew. "Leave tomorrow or we'll come and burn down all your houses," said the man, according to a recording Maung Maung gave to Reuters. When Maung Maung protested that they had no means to escape, the man replied: "That's not our problem." "They said they didn't want any Muslims in the region and we should leave immediately," said the Rohingya resident of Ah Nauk Pyin who requested anonymity. He showed Reuters a letter that the village elders had sent to the Rathedaung authorities on Sept. 7, asking to be moved to "another place". They had yet to receive a response, he said. Residents in the area's two Rohingya villages said they could no longer venture out to fish or buy food from Rakhine traders, and were running low on food and medicines. Maung Maung said the local police told the Rohingya to stay in their villages and not to worry because "nothing would happen," he said. But the nearest police station had only half a dozen or so officers, he said, and couldn't do much if Ah Nauk Pyin was attacked. A few minutes' walk away, at the Rakhine village of Shwe Long Tin, residents were also on edge, said its leader, Khin Tun Aye. They had also heard gunfire at night, he said, and were guarding the village around the clock with machetes and slingshots in case the Rohingya attacked with ARSA's help. "We're also terrified," he said. "If there is violence, all of them will be killed," he said.